In honor of our 30th anniversary and Bill Anthony’s legacy, we are please to share two videos about the preservation of the Iowa State Constitution. The first, made shortly after Anthony’s treatment of the Constitution was completed, outlines the history of the document, and the steps taken to conserve it. The second, made earlier this year, describes the process of digitizing the Constitution to make it available online to all Iowans. Enjoy! 30th Anniversary Benefit Auction: The Results Are In! Friends and visitors came from near and far to join us in celebrating the 30th anniversary of the Conservation Lab. Our Benefit Auction was a resounding success, with lovely music, delicious food, beautiful bindings, and wonderful company. Altogether, the auction raised $15,635 for the William Anthony Conservation Fund. Our heartfelt thanks go out to our bidders, our contributing artists, and everyone who helped make this event a success. 30th Anniversary Benefit Auction: Bid Now! There’s still time to bid on the beautiful bindings and tools in our 30th Anniversary Auction! Click the images below for more details about each item. To bid on any of these items, please email us at lib-prescons@uiowa.edu. Bids will be accepted until 7 pm CST on November 13th. Proceeds from the Conservation Lab’s 30th Anniversary Auction will benefit the William Anthony Conservation Fund. To find out more about the auction, click here. William (Bill) Anthony was born November 9, 1926, in Waterford, Ireland, and began his apprenticeship in bookbinding at the age of 16, later working as a journeyman in Ireland and England. In 1965 Bill came to Chicago to work as a fine binder at the Cuneo Press, where he rose to the position of art director. In 1973, he formed a partnership with Elizabeth Kner and, on her retirement in 1982, continued the business as Anthony & Associates, Bookbinders. While conservation was the mainstay of his business, Bill also worked on edition and fine bindings, and taught apprentices and private students. In 1984, Bill came to The University of Iowa as the first University Conservator. He established the Conservation Department in the University’s Main Library, where he and his apprentices worked on rare books from the University collections, including the Nuremburg Chronicle (1493) and Vesalius’ De humani corporis fabrica (1555). He also executed fine bindings, most of which are in Special Collections at the UI Main Library. In the Conservation Department at Iowa, Bill continued to train apprentices and interns, and offered classes to the University community. A former apprentice from the Chicago days, David Brock, said of Bill that he “molded me gently into a craftsman.” All those who studied with him – apprentices, interns, students, and casual visitors – could say something similar. Bill did not like to criticize but he had an idea of excellence and he wanted to move others in that direction. The esteem in which he was held by his professional colleagues led to his chairing the Standards Committee of the Guild of Bookworkers from 1984 to 1988. Bill’s notable achievements at Iowa include starting the University of Iowa Bookbinding Models Collection and conserving the original constitution of the state of Iowa, which he completed shortly before his death in February 1989. The William Anthony Conservation Fund was established through the generous support of Julie Scott and Jim Fluck, to honor the legacy of Bill Anthony. Since its inception, the Fund has supported a variety of departmental activities, including conservation treatment, equipment purchases, and bringing visiting lecturers to Iowa City. Some highlights are listed below. The task of rebinding over seventy 18th century pamphlets included two challenges: separating groups of 18th century pamphlets bound in 20th century library bindings and developing a functional, graceful and sympathetic conservation treatment that would facilitate scanning and exhibition. The treatment included a collation check, surface cleaning, disassembly of gatherings, optional water washing, mending, endpaper production and re-sewing. The covers for the pamphlets used hand made cover paper stock produced here at the University of Iowa. This distinctive paper was especially created to simulate the stocks used for historical paper case work as it provides the type of excellent handling, toughness and color qualities which are so complimentary to such 18th century text papers. Pamela Spitzmueller was the University of Iowa Libraries’ Conservator from 1989 – 1999. Spitzmueller’s lecture, “Books as Physical Objects or How Conserving Damaged Rare Books and Manuscripts Inspired Me to Create New Book Objects” will cover her 35 year career in library conservation and book arts, from Chicago (Newberry Library), Washington, DC (Library of Congress), Iowa City (University of Iowa Library) and Cambridge, MA (Harvard University Library). Exposed spine, in-boards binding consisting of parchment, flax cord and wooden boards. Gary Frost is a book conservator and book arts educator. He has held faculty positions at Columbia University, University of Texas at Austin and University of Iowa. He is now Conservator Emeritus at University of Iowa Libraries. He is currently teaching book conservation at the Buffalo State Art Conservation Program. Gary has been awarded the Banks and Harris Award of the American Library Association, the Lifetime Award of the Guild of Book Workers and is a Fellow of the American Institute for Conservation. 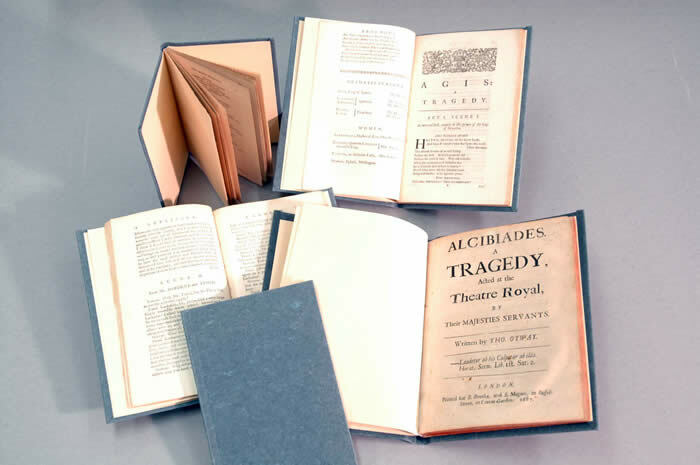 To bid on any of the bindings, please email us at lib-prescons@uiowa.edu. Bids will be accepted until the end of the silent auction, 7 pm CST on Thursday November 13th. William Anthony’s dedication to teaching has greatly influenced the education of generations of bookbinders in the United States. Many Book Artists who create even the most innovative or non-traditional work, received training rooted in traditional craft that can be directly traced to the lineage of William Anthony and his students. My intent with this work was to honor this legacy by creating a binding using the traditional materials and techniques of my craft while pushing the boundaries of conventional book form. This binding is covered in full goat leather with goat leather onlays and blind tooling. The endsheets are pastepaper on bugra paper and the endbands are sewn with silk thread. The boards are composed of many layers of binders board that have been sanded and shaped for a heavily cushioned and sculptural effect. The board attachment and lining are experimental and were inspired by Gary Frost’s work with sewn board attachments. The colors and design choices are directly correlated with the exhibition catalog and the William Anthony bindings featured therein. Anna Embree is an Asso­ciate Pro­fes­sor for the MFA in the Book Arts Pro­gram in the School of Library and Infor­ma­tion Studies at The Uni­ver­sity of Alabama. She teaches courses and work­shops in book­bind­ing, box mak­ing, and spe­cial top­ics in book preser­va­tion and book his­tory. Anna has a strong inter­est in the phys­i­cal and mate­r­ial aspects of book struc­tures. She has col­lab­o­rated with print­ers and paper­mak­ers on lim­ited edi­tion hand­made books, and has exhib­ited widely. I have been making three-dimensional work in book form for over thirty years. Rare book conservation was my profession that required knowledge of the history of binding and the skills to repair and sometimes rebind rare books. The book/bound manuscript needed to be meticulously described and photographed, and a treatment proposal approved by the curator before any work would be carried out. The item’s condition dictated what would be done to it and the less the better! This intimate interaction with a historic object taught me what a book/bound manuscript was and the many techniques used historically. Through this dual career of conservator and artist, I found both parts needed and nourished each other. My artists’ books have always leaned toward traditional materials and book structures that have evolved over time in different cultures. They are never equal, but ebb and flow as discovery in one finds outlets in the other. This includes book structure as well as content. Conservation required ethical decisions, but book arts allowed freedom to create strange or unusual things from a wider variety of materials (such as plastic,metal screen and sheets, or feathers/plant materials with ink, pencil and paint media). Though I do sell works, it is not why I make them. I make them because I have to! Books happen because I’m thinking about something and working with my hands is the outlet. The books I make are meant to be handled,looked into, read, and operated. I work drawing, painting and sometimes text into these one-of-a-kind books. It is best when all parts come together at once, but sometimes a blank book will be empty for years before being filled. Or the text and images come first and I have to find the right structure for them. This artist’s binding is an homage to parchment/vellum – a traditional bookbinding material. Several examples of parchment/vellum bindings by Mr. Anthony are illustrated in this catalog. The spine is flush at the tail and a tab is located at the spine head with a thread bookmark attached – a historic technique. The spine is goat vellum with diagonal long stitches attaching it to the textblock. The covers are a vintage, slightly tinted, handmade English water color paper. Samples of new and vintage vellum/parchment are stitched to the covers, like a sampler, to show the variety of this material. The catalog’s paper covers are inserted inside the new cover turn-ins to stiffen the new covers. Spitzmueller, a distinguished conservator and book artist, served as the James W. Needham Chief Conservator for Special Collections, Harvard University and Harvard College. She also has headed the rare book conservation program at the University of Iowa, and served as a conservator for the Library of Congress and the Newberry Library. Recognized for the technical excellence and historical sensitivity of her conservation treatments, her replicas of historical book structures and her artists’ books have been widely exhibited at libraries and art galleries including the National Museum of Women in the Arts, New York Center for Book Arts, the Boston Athenaeum, Grolier Club, Art Institute of Chicago, the Bibliotheca Alexandrina in Egypt, and the Barbican Centre in London. After earning a degree with distinction and highest honors at the University of Illinois, Chicago, Spitzmueller began studying bookbinding in 1976 with renowned book conservator Gary Frost. During the course of her career Spitzmueller also trained with Anthony Cains, director of conservation at Trinity College, Dublin; Tom Albro and Barbara Meier-Husby at the Library of Congress; Chicago book conservator William Anthony; and Paul Banks, architect and first director of the only degree-granting graduate program in library preservation and conservation in the U.S. In 1979, she received a National Endowment for the Humanities-sponsored fellowship in preservation and conservation hosted by Yale University. She also has received grants from the Kress Foundation and the National Museum Act to support studies in the U.S. and in England. The binding of the catalog is a long stitch sewing of the text block with a soft cover attached using Saltire and transverse twisted tackets. The corners of the covers also have twisted tackets. The cover paper is natural UICB flax case paper. The original covers of the printed catalog are inserted as end sheets and anchored by the corner tackets. A window is cut in the front cover to reveal the catalog title. Cover case paper was joined at the spine to create a reinforced double thickness and to make a sheet long enough to form the cover as one piece. The binding itself is completely non-adhesive. Emily Martin has been making movable and/or sculptural artists books since the late 1970’s. Her books are narrative sometimes autobiographical and make use of format as a metaphor for content. Currently she is exploring Shakespeare’s tragedies. Emily Martin lives in Iowa City, Iowa, USA where she has her studio and also teaches at the University of Iowa Center for the Book. Her work is in public and private collections throughout the United States and internationally, including the Metropolitan Museum of Art, New York; The Victoria and Albert Museum, London; The Museum of Contemporary Art of Chicago; The Marvin and Ruth Sackner Archive of Concrete and Visual Poetry, Miami Beach, Florida; The Library of Congress and others. When Bill Anthony died in 1989, he left me well prepared to do conservation work, but we had not yet undertaken design bindings, though we had discussed them. So, when asked to take part in this project, I decided that, rather than do one full-leather design binding, I would do three quarter-leather bindings with a cumulative value similar to that of a single design binding. Bill and I had discussed the problem that he had faced in binding an artist’s book (was it Picasso?). He felt that a binder was obligated to use the artist’s work in some way in the design. I didn’t feel I could find a design from Bill’s work that would “stand for” him. However, I could represent some of Bill’s favorite elements for fine bindings. Bill loved quarter-leather bindings. He loved paste papers. He loved hidden corners. He loved leather hinges. Now he also—at the end of his career—loved small endbands and their consequent small squares, which I decided not to emulate. Rather, I chose to honor the beautiful, if large, endbands he had made on his earlier bindings. The three bindings vary most obviously in the spine treatment. The leather is the same, but the titling varies. The paste papers—which I made with the same brush Bill used when he made paste papers—are subtly different. The color is always black, but over three different colors of paper and with different brush strokes. The corners are either vellum or leather, with the paper cut slightly differently in each case. One endband is on a velum core, the other two on glued cord—one with single-color silk (like Bill’s later endbands), the other with two-color silk. I was trained at the Conservation Department of The University of Iowa Libraries under Bill Anthony and Pam Spitzmuller. Since 1991 I have worked on my own as a conservation binder and fine binder, first in Iowa City and, beginning in 2013, in Portland, Oregon. William Anthony’s work and, particularly, his fine bindings were both a model and an inspiration for me. The bindings illustrated in this exhibition catalog represented my personal horizons as an apprentice and an aspiring craftsman. The design is meant to suggest the curved fore edges of text blocks tamed by the bone folders entering from around the edges. Bill loved chess and the checkerboard pattern recalls that, as well as his brilliant and creative mind. This is a traditional laced board, full leather binding with full gilt edges, double core silk endbands, leather onlays and inlays, blind and gold tooling and blind tooled edge to edge leather doublures. Mark Esser began his training in bookbinding in 1979 at the Harcourt Bindery in Boston. He then worked in the Conservation Bindery at the Newberry Library in Chicago while studying privately with David Brock. Esser apprenticed with William Anthony from 1982 to 1986, first at Anthony & Associates in Chicago and then at the Conservation Department of the University of Iowa Libraries. He developed the curriculum and was the first instructor for the hand bookbinding program at the North Bennet Street School in Boston, remaining there until 1994. He was the Rare Book Conservator at the John J. Burns Library at Boston College until 2008 and now works privately.